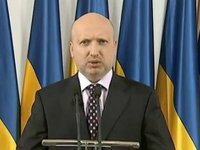 The Ukrainian Central Election Commission (CEC) and the Defense Ministry could find a way to enable the servicemen involved in the antiterrorist operation in eastern Ukraine to cast their ballots in the early parliamentary elections on October 26, Ukrainian Verkhovna Rada Chairman Oleksandr Turchynov said. "I believe the CEC and the Defense Ministry leadership could find a format for doing so if they have this desire. That is, all they need to do is express their will," Turchynov said on TSN (1+1) television channel on Tuesday evening. "A huge number of troops are defending the country outside their military garrisons. And this issue should be regulated legislatively," Turchynov said. In commenting on concerns that, if the servicemen deployed in the warzone are entitled to vote in the parliamentary elections outside their permanent bases, this could be taken advantage of for vote rigging, Turchynov said, "You can't manipulate people in the frontline." He branded these concerns as humiliating and deceitful. It was reported earlier that the Verkhovna Rada had failed to put bills on ensuring the proper organization of the voting process proposed by Davyd Zhvania and on enforcing the constitutional voting rights of the antiterrorist operation participants in the parliamentary elections on October 27, 2014 proposed by Leonid Yemets on the October 20 parliamentary session agenda. Turchynov proposed twice that the parliamentarians vote for putting Zhvania's bill and five times for putting Yemets' bill on the parliamentary session's agenda, but these proposals never garnered the necessary minimum of 226 votes. Yemets' bill would enable those taking part in the antiterrorist operation in the Donetsk and Luhansk regions to cast their ballots at their current location rather than at the place of their residence. Zhvania's bill would not only entitle servicemen to vote at their current location in the antiterrorist operation area but would also tighten security measures at the polling stations and during the transportation of ballots and other election documents. The bill had been previously cleared with the Central Elections Commission. Ukrainian President Petro Poroshenko said it was "immoral for the people's deputies to deprive the best sons of Ukraine, Ukrainian warriors, of their constitutional right to elect their government. They deserve this more than anyone else." Ruslan Kniazevych, the presidential representative at the Verkhovna Rada, said the same evening that servicemen involved in the operation could be enabled to vote in the elections in an extra-parliamentary way. On Tuesday, Poroshenko instructed the chiefs of the Defense Ministry and the other law enforcement and security agencies to collect applications from servicemen wishing to vote and put them on the voter register in the October 26 parliamentary elections. He announced also that 10,000 out of the 25,000 servicemen deployed in the operation area in eastern Ukraine had already been put on the voter lists.